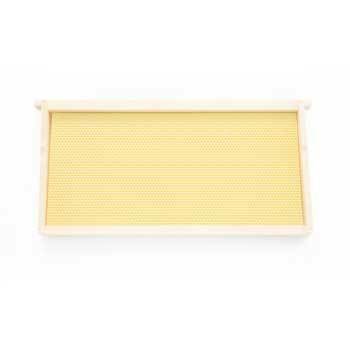 The Hive Body Frame is the beekeeping frame that is used in hive bodies and is available in either assembled (includes Plasticell foundation) or unassembled. Hive Body Frame is the standard size beekeeping frame that is used in the larger size beehive boxes commonly called hive bodies (also called "deeps"). Hive bodies allow beekeepers to gather more honey than is possible with the smaller sized supers. The hive body frame has a slot that allow you to easily install a Plasticell sheet. At maximum capacity, the typical Langstroth hive body fits either 10 or 8 hive body frames depending on the size of the setup. Note*: ﻿﻿﻿﻿Hive body frames have a slot in the frame bottom that allo﻿ws for easy installation of the super Plasticell (foundation) sheets. For durability, we assemble ﻿hive body frames﻿ (and all of our other woodenware products) using commercial grade wood glue and staples. ﻿﻿﻿﻿Using commercial grade materials helps gives the frame an extr﻿a measure of sturdiness ﻿﻿﻿which helps to keep the wood from breaking or falling apart. For maximum strength, wood glue is dried for a minimum of 24 hours before woodenware is shipped. When assembling your own frames, it is advised to use commercial grade wood glue and staples.